I have decided to give the recipe for this wonderful pound cake I have been baking since 1964 and only given the recipe out to family in the past 45+ years. It is very close to the same recipe given by Paula Deen called mama's pound cake. I think only the milk and salt differs a little. I have referred to this recipe always as 'Grandma Turners Pound Cake'. It was given to me by my mother in law Elsie Turner in 1964 and was given to her by her daugter in law from Atlanta, GA. What is so great about this pound cake and the reason I don't turn it upside down out of my large bundt pan or angle food cake pan is it has a cookie crunchy crust that is fabulous and I think very desirable on a pound cake. It is a very large cake and can be made nicely also in loaf pans. 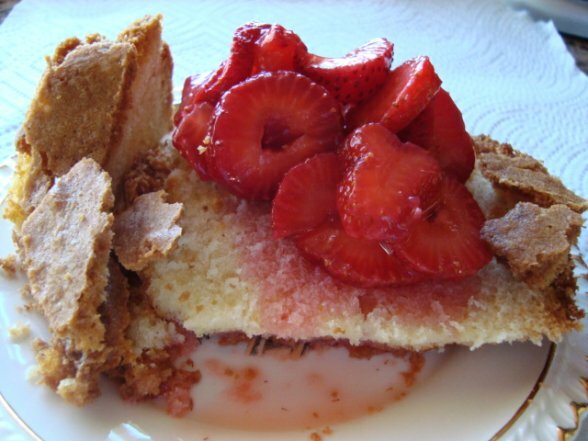 We love it with fresh sliced strawberries, sprinkled with a little sugar to bring out some juices...yumm. A real family favorite for over 45 years. Bring your eggs and butter to same room cool temperature - so the butter is fairly soft -this helps prevent the curdling effect you get when mixing the batter together at different temperatures. Grease and flour pans - Preheat oven to 325F - I use convection oven and bake for 1 hour and 20 min. for my 10+ cup large non-stick bundt pan. Testing with a spagetti noodle poked down into the cake and coming out dry. The crust will be a nice dark golden brown. Sift flour, salt and baking powder together in a bowl '3 times' now I just shake it though a wire sifter once. In a large bowl or mixer, Cream butter, oil and sugar until light and fluffy - Add eggs one at a time to creamed mixture ' I lightly beat them - Add milk and flour to creamed mixture alternately. I end with the flour. Add vanilla extract. You can also use lemon extract. After the cake is baked. Cool for about 5 minutes. Lay a cooling rack on top of the pan and invert. Lay another cooling rack on top of the bottom of the cake and flip back over to see the cookie crust side...try not to eat it all! ADDED - These freeze great. I wrap them up in plastic wrap and then foil. 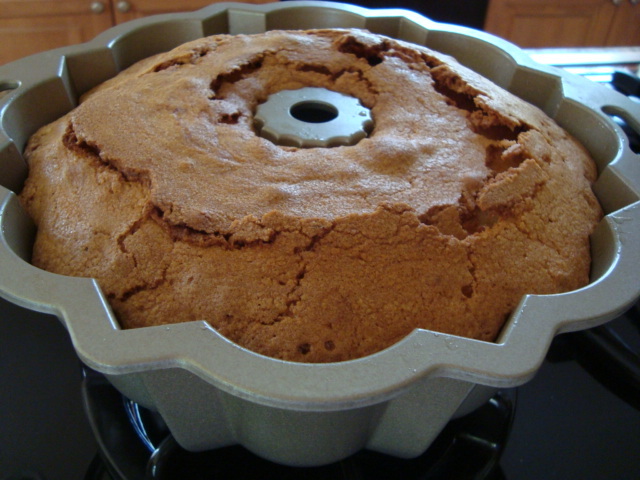 molded bundt top. It's hard not eat this delicious crunchy cookie crust top. Sorry we didn't have any whipped cream today. The strawberries make a nice juice when sliced with a bit of sugar sprinkled over them. Or you also make a lovely puree strawberry sauce to go with some sliced strawberries. It looks delicious! We have strawberries coming on in a couple of weeks so I will give this a try. how many cups of AP flour? 3 cups of flour and 3 cups of sugar! Sorry I messed up. It's been a long tiring day of working out in the yard, we are preparing for a new fence being installed tomorrow. This looks delicious! We also have strawberries in season so I'm going to try this! I made extra ones of these because it's my son's and his wife's favorite dessert. I make extra because my husband wants his now and my son also wants to take one back home. That looks delicious Sylvia. We are still eating the tasteless berries shipped in from warmer climates but it won't be long. Hi and Thank you Eric! I would like to add that these freeze great. I know what you mean about shipped berries! Even CA grown berries at the local grocery store 'look delicious and actually sometimes at peak season even taste great but I know they have been radiated'...they keep way to long without any sign of softening or mold. They look the very same as the farmers market ones. Except the store berries are a little different variety grown to look the same but are able to withstand shipping. I love pound cake and this one looks so good that I'm adding it to my recipes and am going to give it a try. Thanks for the recipe. for such a nice compliment, Patricia and for sharing so many of your lovely recipes! For sharing your family recipe. 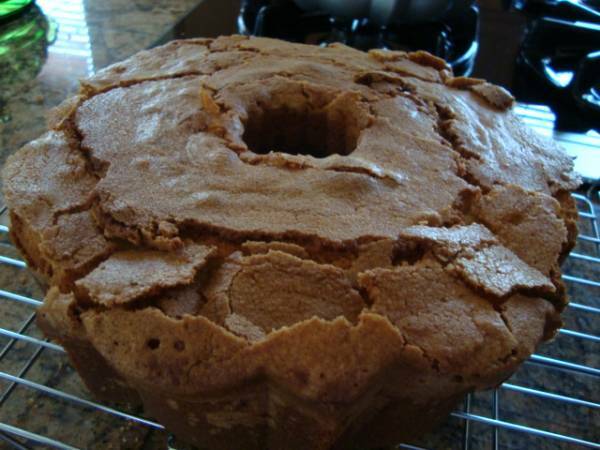 Pound cake is one of our family's favorite as well and yours looks delicious. It would go very well with the wonderful small and sweet strawberries that we are currently getting at the Mennonite farm in Southern Maryland. Thank you and I would love some of those small sweet strawberries you are getting from the Mennonite farm. I have heard they make the very best of jams. This looks like it would make a nice decadent dessert to take to the cottage! This would make a great dessert for travel! I used Land of the Lakes Butter it comes in a 1 pound box - 453gms , containing four individually wrapped butter sticks and I use 2 sticks. Nice conversion to grams, Mini...thank you! I'm glad you enjoyed the cake! We had company, my sons family this weekend and I made 2 and they took half of one home. It becomes addicting! On the bottom of my new bundt pan it says 10-to-15 cups...I ordered it from King Arthur Flours. I just love it after all the years of using my angle food pan...it's so much easier to remove the cake. The pan is rather pricey but it will out last me. It is KA largest size bundt pan. The batter fills it a good 2/3+ of the way...very fluffy batter and I do not stir it down but just pour it around the pan as evenly as I can letting it fall lightly onto itself. I've baked so many of these and also have had the mushroom shape when I overfilled my smaller bundt pan or over filled my loaf pans. The cake can also look done and be raw in the center..over the years I've had my share of those too. An angel food cake pan works well because of it's large size. For gifts at Christmas they can be baked in small foil pans...every pan used bakes up different so the cake needs to tested to make sure it gets baked all the way through..it can look done and have a raw center. I would just rather bake one large one and cut it in halfs or thirds. It does make a nice large cake. My MIL used to put raisins in hers for Christmas. If you eat all the crust you can still serve the cake if baked in the bundt pan..just turn it over and let the design side show..no one will ever know : ) they missed the best part! I'm baking this tonight and not changing ONE THING! And if I want two slices then by golly, I'll do that too. Thank you for sharing this Sylvia.. it is very much appreciated. Oh and Butter conversion.. each stick of butter is 1/2 cup. It does make a big pound cake. And it is very moist. I haven't turned any of it into crumbs because we've been picking berries and the neighbors as well. It is also sweet but there is a delicate balance going on in the mixing of the recipe. Think of it this way... you won't have to add any sugar to the berries and you will have a lot of portions! In the JOY of Cooking cookbook, Rombauer/Becker, 75th Edition page 711, under Butter Cakes (that includes pound cakes) They warn about changing any of the ingredient amounts. Quote: "Do not increase or reduce the sugar, eggs or liquids in these recipes." Adding that alteration "may require additional modifications." No problem with nuts and raisins and such. It is a similar recipe with a sugar reduction of 1/2 cup (2 c in the 1c butter & 1/2 c in the egg whites) and uses cake flour and one cup of sour cream instead of the milk. The eggs (add one more egg) are separated and 1/4 tsp baking soda is used with the dry ingredients, (dry and sour cream are mixed alternately) 1/4 tsp cream of tartar with the beaten egg whites (these two steps replacing all the baking powder.) The two parts are folded together and spread into the pan. Bake 1 hour 10 min. - 1 hour 20 min. I like the cake the way it is. I would shorten the mixing time it took me to work in the flour and milk, I understand that is the reason for the extra fine crumb I have. How's that working for you, Mini? That sent me laughing, now that sounds bad. I guess I should have said that the neighbors and I have been picking berries in the neighbor's field and while picking we were talking about a cake, I had a good one at home and soon there was swapping going on. I swapped berries for cake and others swapped berries for cake and cake for berries and somehow we all ended with berries and cake. I threw a handful of fresh picked red currents onto mine as well. Just cut up strawberries, currents and a slim slice of cake. Wonderful and colorful! And I still have cake! This cake turned out wonderfully. Thanks for sharing a tried and true 'family secret'. My husband asked me to make it again for his birthday (coming up soon). Since he usually isn't attracted to cake...that is high praise indeed. Your welcome! Glad to hear you enjoyed the cake. I have a very similar recipe I've made for years. On occasion, when I've run out of oil, I substituted butter for the 1/2 cup oil. And a few times I've not had enough sugar. In that case I used 1/2 cup less; another time I substituted 1/3 cup honey. And I have also used other liquids instead of 1 1/4 cups milk. The results were always excellent and only a couple of people noticed the difference. Thanks for the family recipe as I love good pound cake. I'm going to give it a shot this weekend. Any thought on the cooking time of your recipe in a convential oven? Your welcome, 3 Olives! All ovens are different and the pan used can affect how fast your cake gets done. I've timed mine anywhere from 1 hr 10min to 1hr 20min. Always best to test for doneness. I find a spagetti noodle does the best test for me. The cake can look done and have a soft center. A convection oven cooks faster and hotter than a conventional oven. Start testing for doneness at about 1 hr 10min. MiniOvens cake was done in 1hr15min in a dark bundt pan. Be sure and let the cake cool before slicing. Oh yes and don't open the oven to soon. Pound cakes can fall easily. Yes, but that's going to change things 'flavor' too... there is more salt in the salted butter than what the recipe calls for so leave out the salt in the recipe. I never use salted butter. You can learn to really appreciate the flavor of butter without all the salt. The amount of salt added to salted butter can be unpredictable and can vary from brand to brand. Salt is added to bolster taste and for other reasons, you lose control of how consistant a product will be. Made it at least 4 times, sometimes adding a bit of almond extract, or zest of a lemon. It's so nice, I've been asked to bring it to a holiday party, as "The Showcase" dessert. Thanks for a very nice recipe. for letting me know how you are enjoying this recipe. I appreciate your leaving a comment. It's still the favorite pick from all the holiday desserts in our home even, after all these years. My MIL used to add a few raisins in it for the holidays. I still prefer it plain though : ) Did I add, it also freezes nicely, if well wrapped in saran and foil and left to thaw in the wrapping.